25 years ago an animated film was released into Tokyo cinemas. 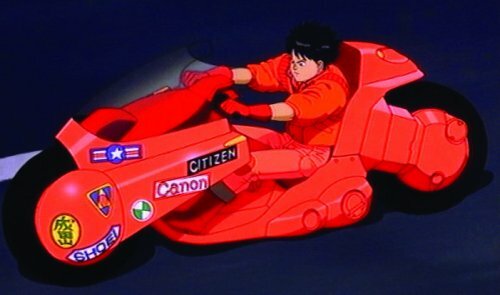 That film was called Akira. A film based on Katsuhiro Iwata’s 2,182 page manga epic. Set 31 years after the film was released and the same time has passed since Tokyo was mysteriously destroyed. The same year that Bladerunner is set. 2019. A huge distopian future of destroyed buildings with biker gangs fighting for control. It went on to storm at the Japanese cinema, breaking attendence records. When it was offered to the US market in 1990, both George Lucas and Steven Spielberg described it as “Unmarketable”. How wrong they were. Considering it was made in the late 80s one of the things that don’t stand out is the fashions. It doesn’t scream “This was made in the 80s” as some films do – even if they don’t aim for it! A film that falls into the failure category is The Terminator. A perfectly good film until they hit the “Tech Noir” nightclub and blam! We’re well into the era! Back to Akira. The film doesn’t have that much memorable dialogue but what is remembered is the wonderful music. A fusion of the classical and the modern. The feel of classical Japanese/Chinese music but played on modern instruments or given a modern twist. The other thing is Keneda’s bike. I’m sure that when you saw that motorbike you wanted one. I did and I’m not all that into bikes – I prefer 4 wheels and a roof! I was going to do a list of 25 Akira facts but I knew I would have dried up around 17 so I scrapped that. So I will just give you a “random 10” instead. It was one of the first Japanese animated films to have the character’s voices recorded before the animation was started – Common in the US but not in Japan at the time. In the space scenes there is no music or dialogue. This is keeping with the fact that sound cannot travel in a vacuum. The film was in production whilst the manga was being written. This is the reason why the film is only the first third of the completed work. 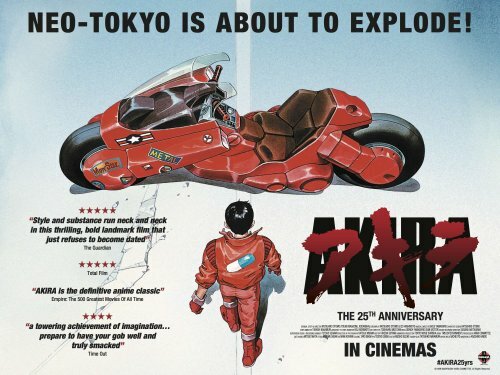 The date of the first coming of Akira is the exact same date as it was released originally in Japan, July 16, 1988. Empire magazine voted the film the 440th greatest movie of all time. It has been referenced in such diverse shows as The Simpsons to The Matrix.